Eighteen years ago my daughter painted a picture in school. She received an award for the painting and it toured the state for three years. It hangs proudly in our home, but I don’t see it much, so I hadn’t thought about it in a long time. This is significant because when I made the discovery that I could see Celestial Hats, I didn’t remember the painting. After all, it was done a long time ago! But last week in art class, the discussion topic was children’s artwork, and I could barely contain my excitement when it hit me. …before we both knew it existed. My daughter’s “abilities” are profound. Ever since she was little, she’s had a strong connection to the Other Side and she was crucial to the writing of my novel. She would see things and come to me with information from the Other Side, which became an integral part of my writing. 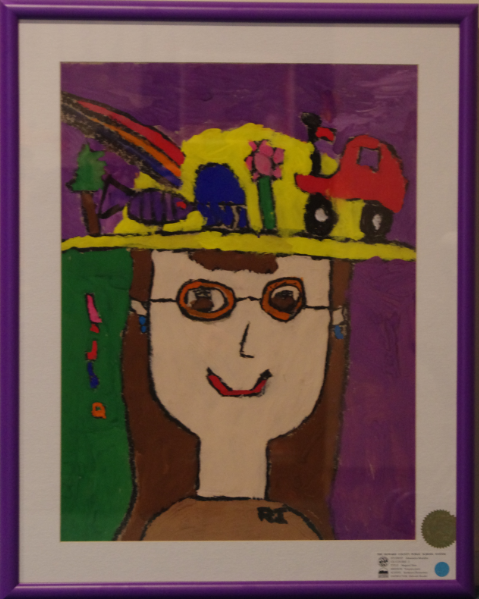 She was seven years old when she painted me in my Magical Hat.